Enable Lightning Experience for your company. Set up monthly or quarterly reviews with your super users. Measure your results and summarize them for your company. Survey your users following your rollout. There comes a time in every successful project where you’ve planned everything, executed on all those plans, and then the launch date arrives. This means it’s time to go big and go live with greatness. If this is your Broadway musical, then it’s opening night, and Salesforce admin, this is your time to shine! Depending on the project, the go-live step can be simple, complex, or somewhere in between. 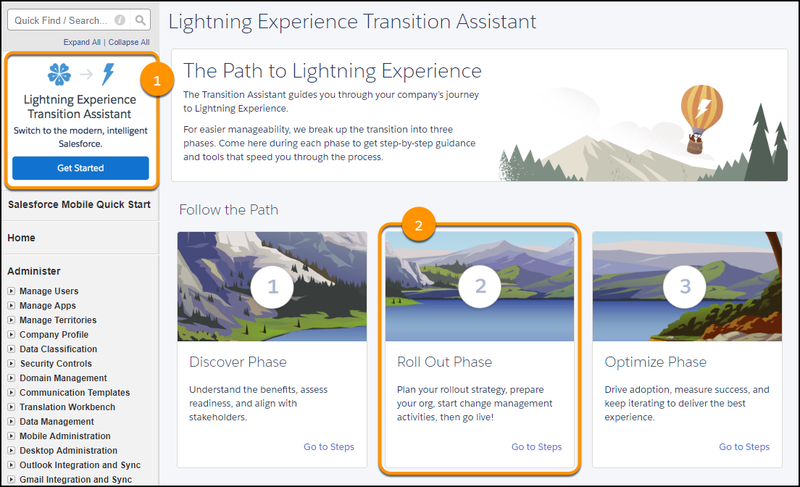 We make it easier with the Lightning Experience Transition Assistant, where you can access all the steps that need to be completed to move to Lightning Experience. Access this page from Setup in Salesforce Classic, by clicking Get Started in the Transition Assistant tile. 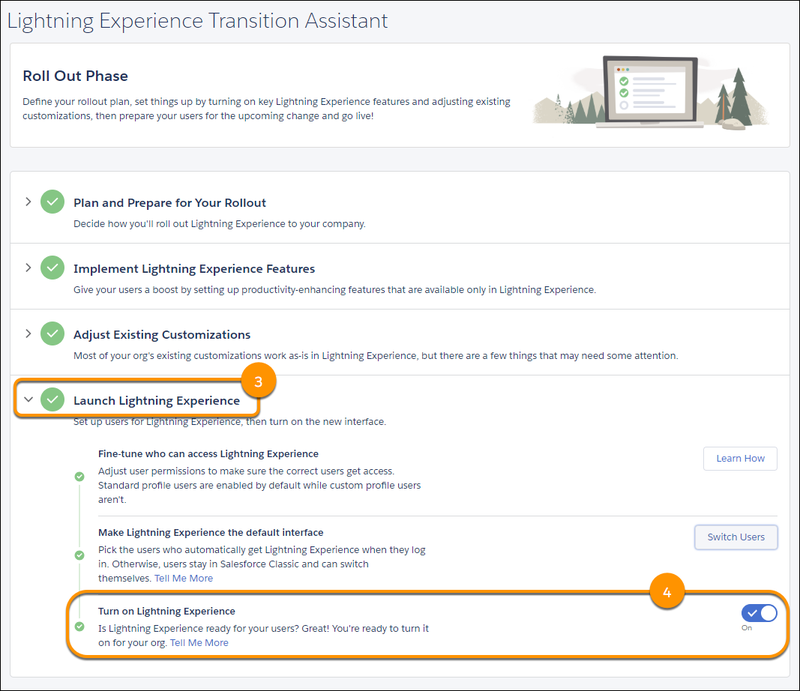 When it’s time to turn on Lightning Experience and set your users free in the new interface, head to the Transition Assistant. But first, review the Enable Lightning Experience unit in the Lightning Experience Basics module for more details. Encores and repeat performances... Just like a Broadway production, your Lightning Experience rollout keeps going after your launch. 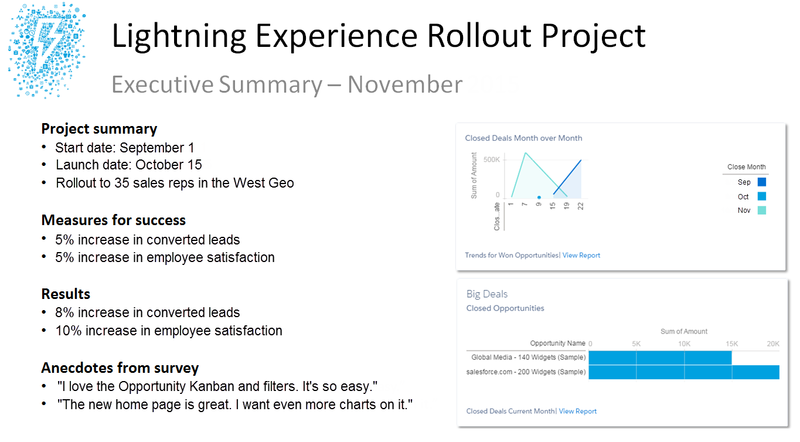 Whether you initially go live with a pilot group or you enable your entire org at once, you want to make sure that your users stay enthusiastic and committed to working in Lightning Experience. This is the time to rinse and repeat. Or rather, optimize your rollout by measuring how things are going and iterating on all the good work you’ve done so far. Monitor how your success metrics are looking. For example, collect feedback on how users are liking the new experience. And measure for things like productivity gains, business success, and adoption rates—including how many users are switching back to Salesforce Classic and why. With this data in hand, you’ll have a solid idea of what your next steps should be. You’ll know which new use cases are priorities for fine-tuning your implementation, which features on the Lightning Experience roadmap are important, and when you’ll be ready to add another round of users to Lightning Experience. 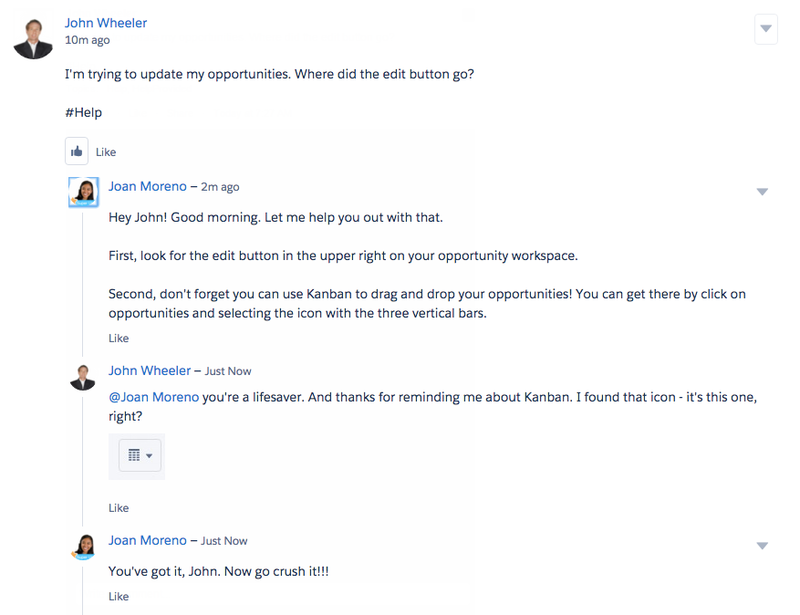 Your super users are key to the success of your rollout. Leading up to your go-live, engage with your super users often. Depending on your training approach, you might be partnering with them as they lead user training in the field. On the day of your go-live, super users play an essential role. Even with the most successful projects, your users are going to have questions. Those questions can come in the form of in-person conversations or questions asked on Chatter. Your super users can help you swarm on those questions, and escalate any bugs or critical issues that are discovered. But your engagement with super users doesn’t end with your go-live. That’s just the beginning. Consider setting up a monthly or quarterly super user forum meeting where you gather all your super users together and talk about the roadmap, feedback, and overall adoption. Create a private Chatter group with your super users to facilitate conversation year-round. And work with your super users to host weekly office hours to answer user questions. As you’ll see, super users provide tremendous value, especially when it comes to sharing feedback, which is critical for measuring the success of your project. Let’s talk about that next. Or, the metrics might have been based on employee or customer satisfaction, or even a mixture of both. For either approach, you need a baseline to work from to track changes in the numbers, so don’t forget to take a snapshot or conduct a survey before you go live. Let’s discuss each approach in detail. You can use several methods to survey your employees and customers. Survey Use a survey app to conduct a formal written survey, measuring overall satisfaction and any pain points. Focus Groups Bring together a group of customers or employees and ask a set of specific questions. Poll Create an informal Chatter poll to gather quick insights. Users can also provide written feedback in the poll’s comment thread. Using these methods, you can obtain metrics about overall satisfaction and any pain points. Following your go-live, after users are comfortably working with the new experience, you can survey again and report on any changes in the metrics. How do you use Salesforce? What do you like best about Salesforce? What would you change about Salesforce? What is most frustrating about Salesforce? What information do you need that you can’t find? How long have you been using Salesforce? Rate your overall productivity using Salesforce. Rate your overall satisfaction with Salesforce. I have the tools I need to do my job: Yes or No. It’s easy to work in Salesforce: Yes or No. In addition to conducting surveys, cultivate an environment where feedback can flourish. Listening to your users boosts adoption. Here are some ideas for how to encourage your users to give regular feedback. Open Forum Host an open question and answer session, online via Chatter or in-person, to get feedback and hear concerns. Chatter Use a Chatter Topic (“feedback”) to collect responses from your users organically over time. Review all the posts monthly or quarterly. When you’re receiving feedback, it’s important that your users feel heard, even though you can’t address all feedback. Consider starting a “You Asked, We Listened” program where you address some employee feedback items every quarter. 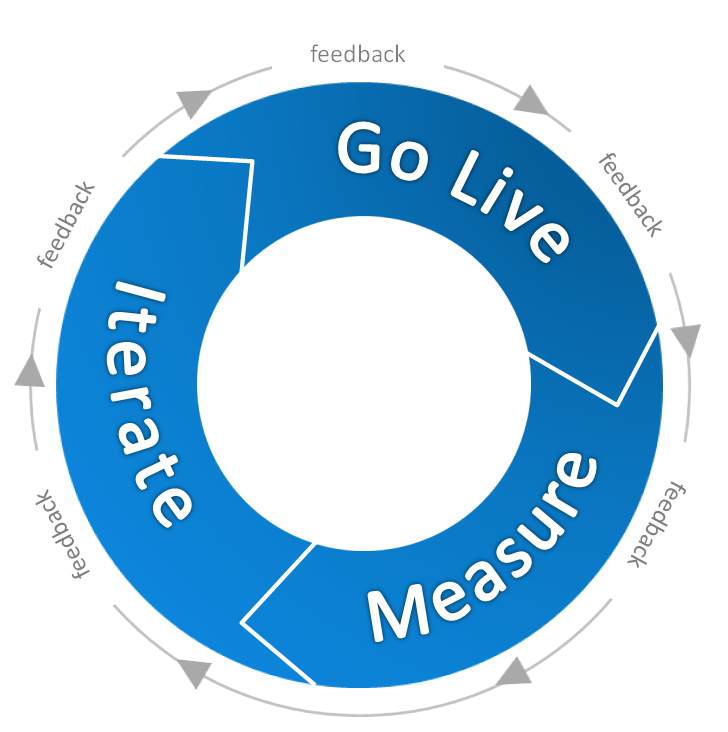 Whether you’re doing a limited pilot or rolling out to your whole company at once, the goal is to go live, measure your results, and then iterate. Then repeat. Reporting snapshots are a way to analyze trends over time, right in Salesforce. Search for “Reporting Snapshots” in the Salesforce Help to learn more. Your Executive Sponsor has been your project champion from the start. Now it’s time to prepare a summary for your sponsor on the overall project status and any results you’re able to share. This is important for your Executive Sponsor to be able to showcase Return on Investment (ROI) for the resources that were allocated to complete the project. Note any next steps still planned. Looking for a sample Executive Summary document? Sorry, we didn’t make one. Just kidding! Check the enablement pack. Congratulations! You now have the tools you need to roll out Lightning Experience. Hopefully, you’ve also picked up some tips along the way to help you with other rollouts beyond Lightning Experience. Whether you’re piloting with a group of users or rolling out to your entire company at once, this is your chance to go big. Good luck with your rollout!